The new year has begun and I don't know about you, but I am so looking forward to all there is to come in 2014. 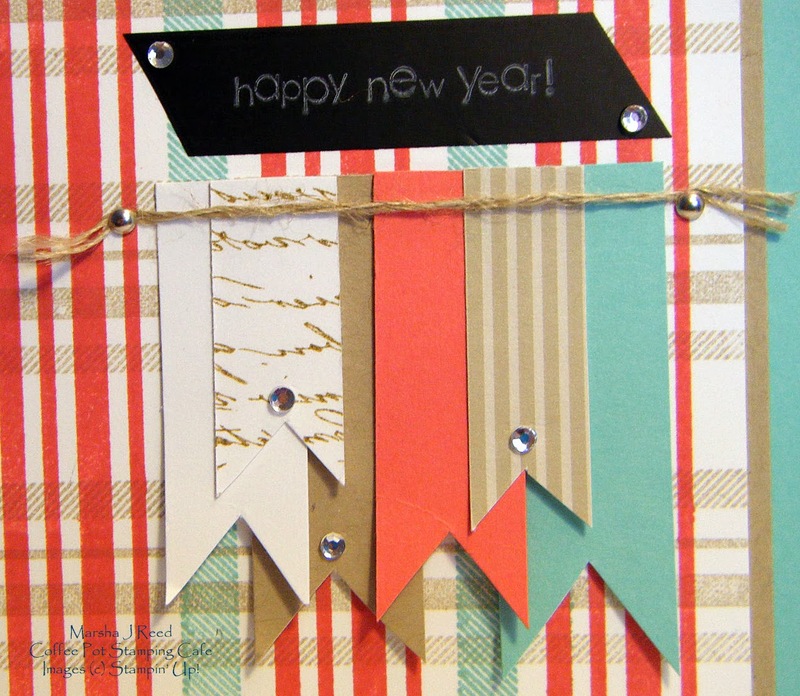 Here is a New Year's card made from another of the plaid backgrounds that my friend, Heather, stamped for me. 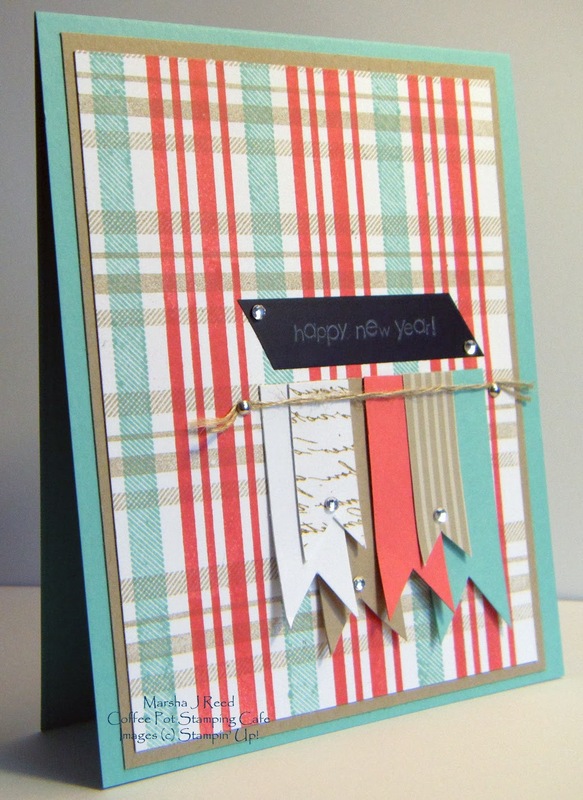 The new In Colors from Stampin' Up!® were perfect for this plaid. The colors used are Baked Brown Sugar, Coastal Cabana and Strawberry Slush. I love how they look together. The 'happy new year' sentiment is from the Teeny Tiny Wishes stamp set from Stampin' Up!® I used a chalk ink pad from Color Box to stamp it onto a strip of chalkboard tape. The sketch I used is the current one over at Freshly Made Sketches. 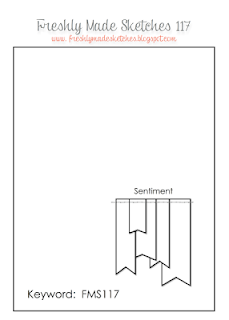 The sketch was perfect for this background and I love how the simplicity of the sketch allowed for the plaid to shine. You still have time to play along, too. With the day being snowy and cold, I'm staying in all the day long. The plan is to get a bunch of new designs made. 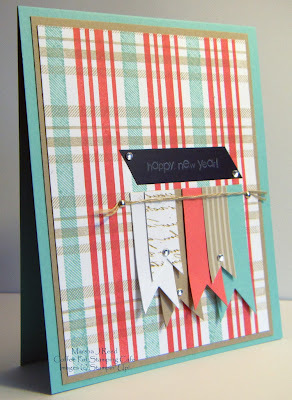 I have one of the birthday cards I need for January done and have two more to go. Three of my grandsons have birthdays one right after the other. What a pretty card! I love the plaid background -- it looks like dsp. Thanks for playing along with us at Freshly Made Sketches! Pretty mix of patterns! The plaid is lovely! Thanks for joining s at FMS! Lovely card Marsha! Love that plaid! The bling is a great addition! Thanks for joining us at Freshly Made Sketches!